Santos Churata has been a fan of the Transformers universe since early childhood. Now a licensed home builder in the Bolivian city of El Alto, the 34-year-old uses his passion for autobots and decepticons as inspiration for the design of eye-catching houses for the rich. The city of El Alto, located at 4,070 meters above sea level, has become well-known for a unique architectural style called “chola architecture”. Sometimes described as psychedelic baroque, it incorporates symbols of native Andean culture, Chinese design elements and all the colors of the rainbow. For the new wealthy indigenous Bolivians, who have made millions in recent years, these modern-day palaces are a reflection of both their social status and their proud Aymara heritage. In 2015, there were over 170 unique chola houses in El Alto, enough for the city to set up a tourist route for the most impressive ones. Most of these chola homes were designed by Freddy Mamani Silvestre, who is considered by many as the creator of the architectural style, but in recent years, a new builder has been getting a lot of attention for revolutionizing the style with his ideas. Santos Churata is only 34 years old, but he has already built around 30 chola houses in various neighborhoods of El Alto. What really makes his work stand out from those of other builders is the comics-inspired design. 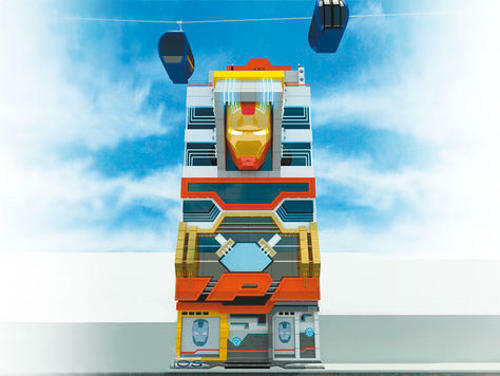 Four of his houses have been inspired by popular Transformers, like Sentinel Prime and Optimus Prime, and he is currently working on a $700,000 Iron Man-themed residence. Churata says that he has been a fan of superhero and robot comics and movies for as long as he can remember, and that his life-long passion has given him all kinds of interesting ideas for architectural design. Santos is not a professional architect, but claims to have mastered the necessary skills to design and build large, intricate houses by working alongside his father, an actual architect, since he was 16 years old. After seeing his previous work, clients don’t really care about his degree, and trust him to build them the most eye-caching homes imaginable. Santiago Churata’s first house was built in the Alentejo neighborhood, and themed after Sentinel Prime. The facade was done in red, blue and silver and featured reflective black window shaped like robotic faces. The silver doors are shaped like the popular logo of the autobots, which also appears engraved into the floor. The Bolivian builder has been working on the Iron Man house for two years, and hopes to finish it by mid 2017. The five-story building will feature a large head of the Marvel superhero and will be primarily painted in the iconic red and gold combination. His idea was that people passing by the house will be able to come face to face with Iron Man. “The idea is purely mine, with the absolute confidence of the homeowners,” Churata told La Razon. The unusual design ideas of Santiago Churata have proven very successful, and he now has several clients asking him to to build or remodel houses, convention centers, galleries or shops, and he strives to come up with unique ideas for every one of them. “I always tell my clients that I cannot do the same idea twice,” he says.